Attorney Claudine Umuhire Gasana has focused her practice on immigration laws and practices applicable to families, foreign skilled workers and U.S. employers. Her services range from individually tailored family-based immigration solutions to business and employer-based solutions for oil and gas, healthcare, higher education industries and more. Attorney Gasana was looking for a fresh way to represent her business. She needed a logo design, business cards design, and new and updated website built on WordPress. Claudine Gasana also was looking for SEO and PPC solutions that would bring more traffic to the website and more clients to her business. 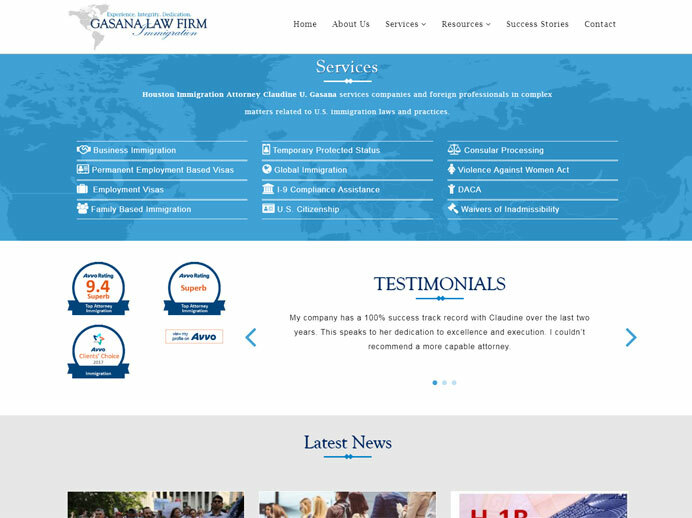 We recreated a website for Gasana Law Firm keeping the original style but adding fresh and modern touch to it. We are also working with Attorney Gasana on a monthly basis on improving search engine optimization for the company and increasing the traffic. We implemented multiple PPC campaigns and other marketing strategies to improve the company’s sales. At aStash we provide Fort Collins website design and development services. We have years of experience in internet marketing and search engine optimization. Whether you need a custom web design, content management, social media marketing or seo services, we can help! See more about our wordpress web design Fort Collins services check out our website design pricing, and see our digital marketing & WordPress maintenance packages.